Approximately 15,000 homosexuals were killed during the Holocaust - and forgotten by most of the world for over half a century. This group, comprised of mostly German men, were subjected to some of the cruelest torture by the Nazi's. For decades after the war, homosexuals remained the subject of discrimination and as a result were offered no consideration for the hardships and losses the group endured during the war. 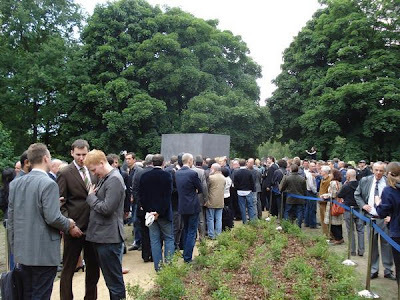 Last month a memorial was finally erected in Berlin, Germany, to honor these victims, and their families. 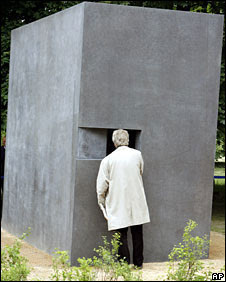 The memorial is four-meters high and features a window showing a film of two men and two women kissing. The has been in development for several years and has faced scrutiny in terms of its purpose (as being focused on exclusively focused on homosexuals) and even its form (as mimicking a "peep show" like experience, according to some). Last month, the memorial was inaugurated by Berlin's gay mayor, Klaus Wowereit, and Germany's Culture Minister, BerndNeumann and is situated close to that for the six million victims of the Holocaust. 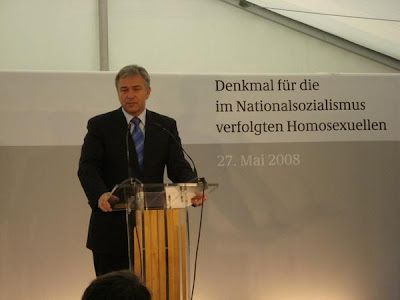 Recently, Volker Beck, a member of the German parliament and supporter of the memorial, spoke with NPR to give an insider look into the history of homosexuals during the holocaust and the experience of building the monument. Here is the AUDIO LINK to the interview.